For 20 years, Anne was one of the most sought after motorsports artists. Today, she has turned her eye and hand to the natural world. “In a way, it’s closing a circle. Birds and other wildlife were the subjects of my earliest paintings. My grandfather had a number of feeders at his Fort Collins (Colorado) home and he was very proud of the birds that visited his yard. I would spend several hours at the table sketching and painting the birds I saw. 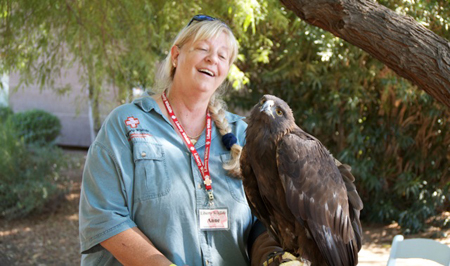 Anne dedicates several hours each month to volunteering at Liberty Wildlife, a Phoenix-based rehabilitation and education organization that treats injured animals. Rarely, a bird cannot be released back into the wild. Zoos claim some while others become avian ambassadors for their species at Liberty’s presentations. 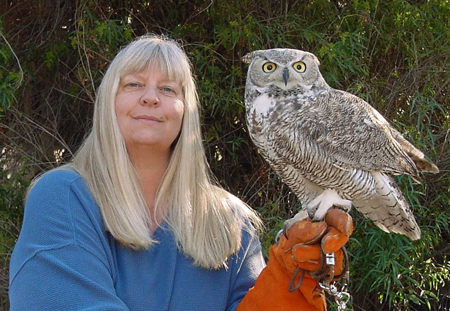 Anne’s specialty is assisting eagles, hawks and owls to become accustomed to people in educational and group settings. Anne Peyton is based in Ahwatukee Foothills, Arizona. She is a Master Signature member of Women Artists of the West, a Signature member of the Society of Animal Artists, a Signature Artist’s Guild member of the National Oil and Acrylic Painters’ Society, a Signature member of the Artists For Conservation, a Signature member of the American Plains Artists, a Signature member of the American Women Artists, and an Associate member of the National Society of Painters in Casein and Acrylics. Her work has been seen in the several exhibitions, including Birds in Art (Leigh Yawkey Woodson Art Museum, Wausau, Wisconsin); the Arts for the Parks (Jackson, Wyoming); Miniatures and More (National Museum of Wildlife Art, Jackson, Wyoming); National Society of Painters in Casein & Acrylics annual exhibition (Salmagundi Club, New York City); and numerous Society of Animal Artists’ and Artists For Conservation exhibitions. Anne’s paintings are part of the permanent collection at the Driftless Glen Distillery, Baraboo, Wisconsin; Leigh Yawkey Woodson Art Museum, Wausau, Wisconsin; Bennington (Vermont) Center for the Natural and Cultural Arts; the Arizona Sonoran Desert Museum, Tucson, Arizona; and the Great Plains Art Museum, Lincoln, Nebraska. View a complete listing of Anne’s shows and societies to which she belongs.